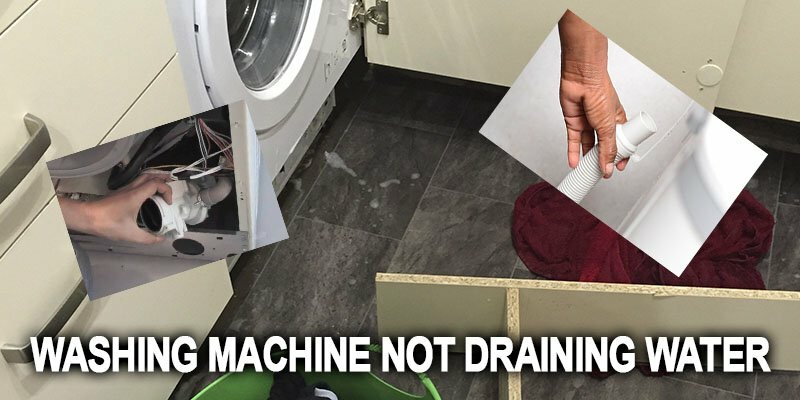 Washing machine does not drain – it is one of the most common problems. Inspect pump filter for clogs. It is located on the front side of the washing machine, in the bottom, under the small hatch, on the right or left side. Washing machine does not drain water if there is a clog in the filter. You will need to unscrew and clean it. Check pump impeller located behind the filter. Use a flashlight to shine to the hole from which the filter was unscrewed, and check the impeller itself and around it. If, after removing the filter, the remaining water has not drained from the drum, it means that the pipe connecting the drum with the pump is clogged. Then, for your convenience, you need to disconnect the pump from the washing machine or rather disconnect not the pump itself, but the entire drain unit or the pump chamber. This is a plastic part that allows to put together the pump, the drain pipe and the drain hose, as well as to fix this entire unit to the body of the washing machine. The pumping chamber is fastened with screws; once you remove them, it will be easy for you to detach it from the housing and it will be easier to get to the hose. After checking the units mentioned above, it is necessary to inspect the drain pump. Connect the washing machine to the power supply and select the “drain” (or “spin”) program. In this mode, the pump should start rotating, which you can observe in the filter hole. You need to shine up with a flashlight there and make sure whether the pump impeller rotates or not. If it is not rotating, the pump must be replaced.